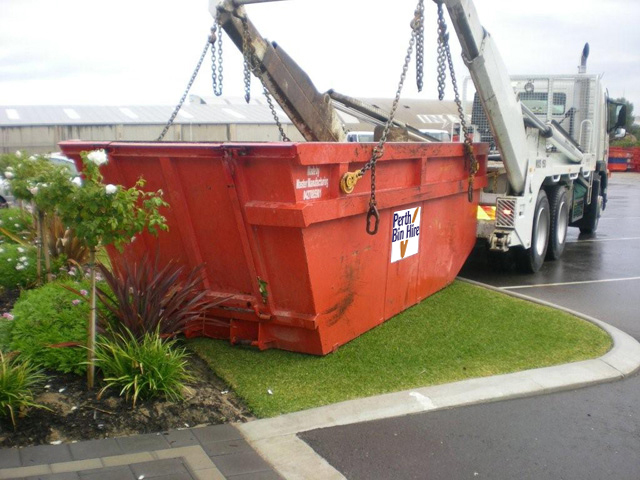 Why choose to hire a skip bin from Perth Bin Hire? Excellent Customer Service – We have a friendly, professional and experienced team who understand that customer satisfaction is paramount. The office staff who take your orders, and the drivers who deliver your skip bins will do their utmost to make sure your entire waste disposal experience with Perth Bin Hire is as pleasant and satisfying as possible. Reliability– Perth Bin Hire has always recognised the importance of maintaining modern, well maintained vehicles in order to maximise reliability and safety as well as minimising impact on the environment. Mixed Waste – You can mix any type of rubbish in our skip bins (excluding hazardous waste*). We do the sorting for you at one of our Department of Environment Regulation licensed transfer stations. 25 Years’ Experience in the Perth Metropolitan Area – We know our business and we know Perth. We have been providing Perth residents with skip bins for over 25 years. In that time our business has expanded considerably and we believe this is primarily due to our commitment to customer satisfaction. A Huge Range Of Services beyond skip bins and general waste disposal, including Recycling and Green Waste Disposal to meet the needs of our residential clients. We also offer removal of hazardous waste. Waste disposal is something that we deal with everyday, whether we’re at home, school, office, hospital or public places. Waste management is one of the most significant obligations of good citizenship, protecting the environment and keeping the community clean. How we approach the disposal of our domestic and industrial waste can have positive impacts both on the environment in general and also on the health and wellbeing of the people with whom we share it. Solid, liquid, gaseous or radioactive waste, all of these require different methods of disposal. A sound approach to waste disposal brings positive benefits to the environment. How we collect, transport, process and dispose of waste materials, as well as how efficiently we recycle are the keys to reducing the harmful effects of our activities on the environment and on our fellow citizens. All of Australia’s major cities, including Perth, have extensive waste disposal resources, from waste transfer stations to landfill sites. But companies and households in Perth who want to use best practice in the disposal of waste have the advantage of being able to call on Perth Bin Hire. At Perth Bin Hire, we know how to handle the most problematic waste materials responsibly, efficiently and in compliance with the ever-increasing volume of environmental legislation. Segregation, recycling and reuse remain the three pillars of effective waste management. When you call on Perth Bin Hire to collect your waste, we first take it to our waste transfer station. There we sort it, setting aside what can be recycled. Only then does the residue go into the waste disposal site’s landfill. These days, the legislation governing waste disposal seems to grow exponentially. It’s almost impossible for private citizens, or even trained managers, to be certain of compliance. And the technology front advances relentlessly – what was not recyclable yesterday can today be put to productive use, using innovations in techniques. That’s why you need the services of a professional waste management company such as Perth Bin Hire – experts in segregating and recycling the different components of a waste burden. At Perth Bin Hire, we provide waste collection services for household, industries and businesses. We specialise in creating waste management solutions for the efficient removal, transport or recycling of your wastes. Contact Perth Bin Hire for waste disposal services or if you need a waste management company, call 9378 4411.